Reclaim your Time, Take Back your Life is designed by specialists in Time Management and Peak Performance with over 20 years in the field. Investing in this course will reward you with an extra hour a day to spend on the things that count and stop time-waster regret from poisoning your days. Use Outlook as it was designed - to look up and out and get a grip on your time. Get this right and start thinking what you will do with an extra day a week. If you aren’t feeling the benefit after 90 days, the course is free! "I'm working harder than ever but I can't get to the really important stuff"
"I feel totally overwhelmed with email - the constant stream of incoming tasks and interruptions is killing me!" "No matter what I do it is still not enough"
"I spend my days putting out fires and stressed out because I am not getting to my commitments"
"I hate being seen as unreliable because I am overloaded and end up missing deadlines"
"I feel constantly challenged because I have to bluff my way through things I haven't yet completed"
"I rob my family and personal time to stay on top of things"
Effective time management can become the Holy Grail leading to increased productivity, reduced stress, and greater control at work and home. One of the most powerful tools for effective time management is built into your computer in the form of Microsoft Outlook. All of these can help but from a cost perspective, this self-directed course wins on all fronts. It captures the best of the knowledge and research from career practitioners all in one place. 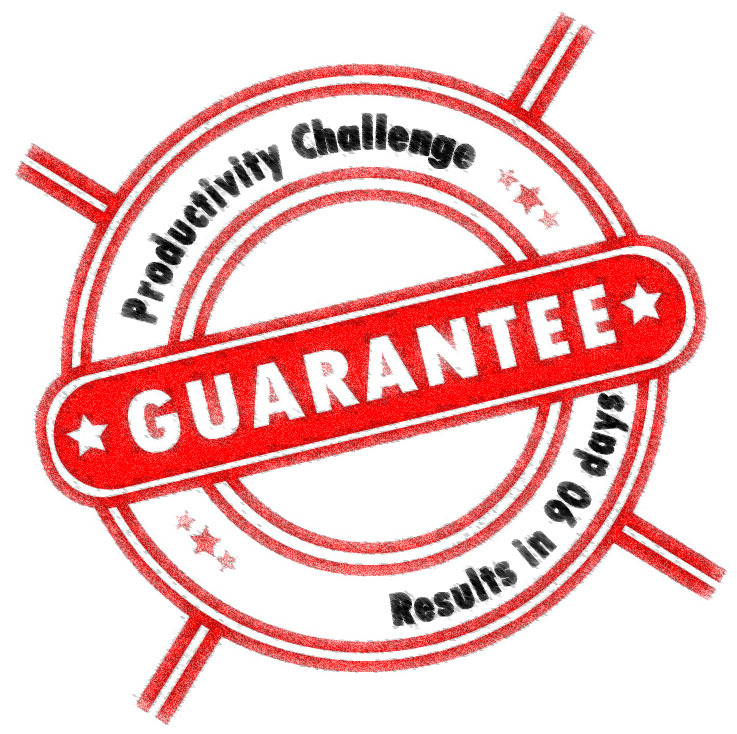 The 90 Day Productivity Challenge IF YOU AREN'T BEING MORE PRODUCTIVE IN 90 DAYS OR LESS, THE COURSE IS FREE. It’s simple: If you complete all the coursework and are still not getting an hour back a day in 90 days or less, you get a 100% refund. We’ll even jump on the phone if that's the case to help sort you out to get you the results you need. If you put in the work and go through the process, you WILL be more productive. I can confidently say this because I have already taught this course to many people in many different types of jobs. So, in case you’re wondering… Yes, we’ve got you covered! Step 1: Manage your Information: Are you a filer or a piler? Step 1: Managing your Information: Are You A Filer Or A Piler? Where Do Productive Workers Spend Their Time? Week 6: The Quarterly Challenge: Are you up for it?